There are so many art museums in Los Angeles that it can be hard for art lovers to decide which ones should have priority when you're just in town for a short time. And after you've seen the big ones, there's the question of what to see next, and which ones are worth a detour. Let this list guide you on your way. Art museums 1 and 2 on this list are almost a tie if you take into account architecture and the view, but for the sheer volume and diversity of art that you can see at one location, Los Angeles County Museum of Art edged out the Getty Center, especially with the addition of Broad Contemporary and the Resnick Pavilion. The encyclopedic collection ranges from pre-history to contemporary art. The Getty Center, high on a hill in Brentwood, houses the J. Paul Getty Museum's fine art and photography collections, while the antiquities reside in Malibu at the Getty Villa. The Getty Center is as popular for its unique architecture, beautiful gardens, and stunning views as it is for the breadth of its art collection. The Norton Simon Museum in Pasadena is a much more manageable size than LACMA or the Getty Center, and yet it contains some of the finest works of art in Southern California. All the Impressionists are represented, with a special focus on Picasso and Degas. The entire lower level is devoted to Southeast Asian art. The Broad is LA's newest art museum, showcasing the extensive contemporary art collection of philanthropists Eli and Edythe Broad. It is located in Downtown LA next to the Disney Concert Hall and across from the Museum of Contemporary Art. The Getty Villa in Malibu contains the J. Paul Getty Museum's antiquities collection on an Italianate villa on a bluff overlooking the Pacific Ocean. While the Greek, Roman and Etruscan statuaries are impressive, it's worth a visit just to admire the Villa and the view. The Museum of Latin American Art is a gem of an art museum in Long Beach. MoLAA is unlike any other collection that you'll find in the US, containing only the work of major contemporary artists from Latin America. The Museum of Contemporary Art and its partner, the Geffen Contemporary at MOCA, a few blocks apart in Downtown LA, are hard to rank because there aren't really any permanent exhibits. So where they should fall on a "best of" list depends on the current exhibition. Check the exhibition schedule before planning a visit. Although better known to locals for their magnificent gardens, the Huntington Library's Art Collections are equally worthy of a visit. The collections are spread through multiple buildings on the extensive grounds, so bring your good walking shoes. Highlights of the collection include American Art, Greene & Greene and other Arts & Crafts Movement furniture and 18th Century British art. The Library Collection contains a 1410 Elsmere manuscript of Chaucers' The Canterbury Tales and an original 1455 Gutenberg Bible. The Bowers Museum in Santa Ana isn't a traditional art museum, although they do exhibit art. Most of their exhibits are more of an ethnographic take on art. The permanent collection includes California Indian and other Native American art, pre-Columbian art, Asian and Pacific Islands art and art from Africa. They also host major traveling exhibits, such as the Terra Cotta Warriors. The Annenberg Space for Photography in Century City is a relatively small space, but you could spend many hours perusing photo exhibits. Although fine art photography is not the focus of the Annenberg Space, and you might equally well find stunning landscapes or grisly images of war and famine, the art of photography is definitely in evidence. Every major city has a Van Gogh and a Renoir, but only LA has the Museum of Neon Art in Glendale. The Museum of Neon Art also hosts nighttime neon art tours of Los Angeles. The Craft and Folk Art Museum, on Museum Row across from LACMA, takes a broad view of folk art as "all art made in a cultural and social context." So don't expect to be limited to African wood carvings and Hmong needlework, although they are part of the collection. Exhibits might feature furniture, textiles, musical instruments, tattoo art or any manner of human creation. The UCLA Hammer Museum in Westwood, next to the UCLA campus, features rotating exhibits from their collections which range from French masters to historic political art and graphic design to contemporary artists of the last decade with an emphasis on Southern California artists. The Museum's sculpture garden is actually on the UCLA campus. The Hammer Museum is known for having one of the best art bookstores in the country. The Pacific Asia Museum is a compact museum in Pasadena featuring arts and crafts from Asia and the Pacific Islands. The museum may be closed due to renovations so check with the website updated information. The Fowler Museum on the UCLA campus focuses on the past and present cultural arts of Africa, Asia, the Pacific Islands, and the Americas. They have a massive collection of artifacts, but only a small portion can be on display at any given time. The Long Beach Museum of Art makes the list above the Santa Monica Museum of Art and Orange County Museum of Art because they have items from their permanent collection on exhibit (even if they're not very interesting) as well as having some high-quality temporary exhibits, and because they have by far the best view of the three. The Long Beach Museum of Art is perched on the bluff above the beach in Long Beach. Santa Monica Museum of Art is a small museum located inside the Bergamot Station art complex. 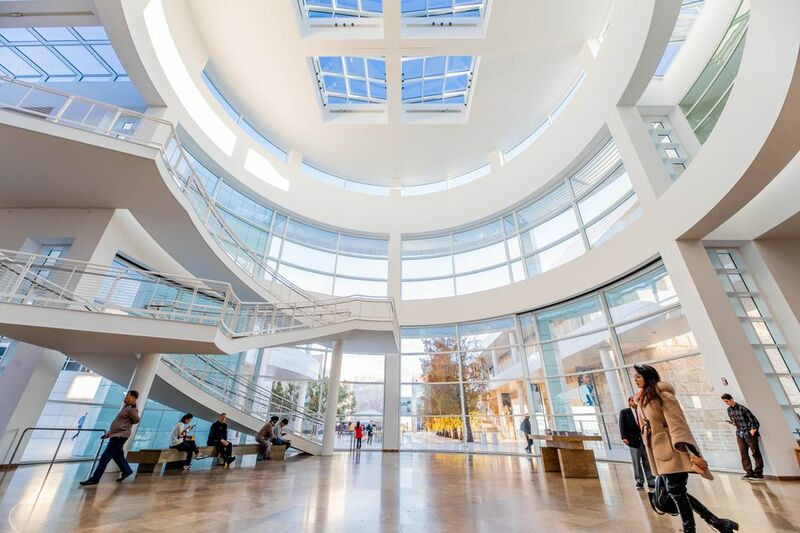 Although the Santa Monica Museum of Art does host interesting and thought-provoking temporary exhibits, one of the best things about it for art lovers is that it is surrounded by a dozen art galleries, where you can view for free and purchase the work of established and emerging artists. The Orange County Museum of Art in Newport Beach is a small modern and contemporary art museum with a collection that focuses heavily on California artists of the 20th and 21st centuries. This is a great little museum for discovering up and coming artists. OCMA's California Biennial exhibits feature innovative contemporary artists of California. There is no permanent exhibit. The Pasadena Museum of California Art is a small museum in Pasadena that presents the work of California artists in exhibits designed to put California art and design into a greater context. The USC Fisher Museum of Art owns some really cool stuff, including Armand Hammer's earlier collection of Dutch, Flemish, German and Italian master that he donated to USC before starting a whole other collection that he then gave to UCLA. However, the chances of seeing many of the Fisher's masterpieces are slim, since there are more exhibits of outside work than of the museum's own collection. Other temporary exhibits may or may not be of interest to the general public. The Gallery is only open from September through May during USC's school year. The Laguna Art Museum in the upscale artist colony of Laguna Beach in Orange County collects and exhibits California art from the 19th century through present day. In addition to the artists themselves living in California, there is a special focus on art that represents the life and history of the state. The American Museum of Ceramic Art in Pomona collects, preserves and presents significant ceramic works from around the world from ancient times to the present. They also offer onsite pottery and ceramics classes and a variety of family programs and travel opportunities. MUZEO is a museum in Anaheim, CA that hosts temporary touring shows including fine art and pop culture exhibits. The Corita Art Center is a small gallery dedicated to the work of artist and activist, Sister Corita Kent, who created a popular series of serigraph prints in the 1960s and 70s. It is located on the campus of Immaculate Heart High School in Hollywood. The Marjorie and Herman Platt Gallery and Borstein Art Gallery at the Belair campus of the American Jewish University host major art exhibits of Jewish and non-Jewish artists.